Fifteen-year-old Hans Richter travels far from home to find work in the locks of a river. His father had taught him that there is a Raft that will support him in the deepest waters and amid the fiercest storms. 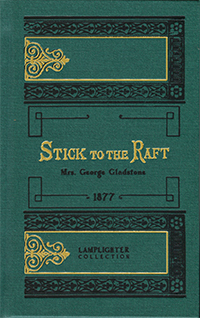 When Hans becomes the target among jealous peers, he learns that it is not always easy to "stick to the Raft." Mischief turns to maliciousness, and Hans is the recipient of a serious injury. Will he stick to his plans for vengeance, or will he "stick to the Raft?" From Marilyn Perkins of Deer Park, Wisconsin on 2/11/2018 . A creative story with a good message. From Anonymous of Boerne, Texas on 12/28/2012 . Stick to the Raft is a delightful story about a fifteen year old boy named Hans. This book touches on the many facets of walking as a Christian. As Hans guides the rafts over the weir he reminds those he meets to trust and rely on the Lord Jesus to "Stick to the Raft." As Christians we are to grow in our faith; and the wonderful example of how Hans continually learns to rely on God's strength instead of his own and to overcome the desires of his flesh is inspiring. Scripture abounds in the pages of the book urging the reader to cling to the Friend that "sticks closer than a brother." One of the refreshing elements of the story is how Hans learns to rely on the Lord and that whenever he has a setback the solution is to press deeper in to God. This book is filled with wonderful lessons on the importance of honesty and industry, the power of love and forgiveness, that blessings are found in the midst of tribulations, dealing wisely with unbelievers and that temporary loss can be used for eternal good. Truly our lives speak even louder than our words and both should proclaim the glory of God. In this story you will also see the bad fruit brought by laziness, bad company, and revenge; but you are also shown that God is able to save, forgive and restore. The various characters in the story illustrate the truth of God's word and the power of His love. This is a book that can strengthen your faith and encourage your heart. "Let him who glories, let him glory in this, that he understands Me and knows Me, that I exercise loving kindness, justice, and righteousness in the earth; for I delight in these things saith the Lord." May God continue to use this book to strengthen our reliance on the Lord Jesus. As Hans reminds us, "There will be no real change in you unless you change toward God. He says to you, 'My son, give Me thine heart.' Oh! Do not withhold it from Him."